When Google first launched its much-hyped but hard-to-describe Google Wave, I was as quick as anyone to check it out – and just as quick to give up in frustration. All “beta” applications have their bugs and glitches, of course, but Google Wave had a few more than its share in the early days. And with entry originally restricted to certain invited GMail users only, logging into Wave felt a lot like wandering around an unfamiliar convention center full of invisible strangers, vainly looking for one friendly face. Added to all that, Wave’s apparent attempt to be all things to all users made for a complex and unintuitive interface. In short, for many of us, the benefits of using Wave didn’t equal the effort of figuring it out. The whole site runs faster – much faster. It finally feels stable. Bugs and browser freeze-ups are now plesantly rare. Blank templates (and a couple of tutorials – on using Wave for event planning, drafting documents, and brainstorming ) are now available to get you started quickly. And, in mid-May, the “by invitation only” barrier came down. Now, Wave is available to everyone online. If you’ve got an email address – any email address – you can access and use Google Wave. Okay, but what’s Wave good for? So, imagine Google Wave is the phone. Jon and Marc and Rob start talking, but at different times. They add some thoughts. I sneak in, read over what they’ve done, and I add some thoughts of my own. It’s as if we’re on the phone planning something, and yet, I added my ideas at a totally different time. It’s threaded. It’s sorted. It’s a kind of thing where you can go in, see the flow of the conversation, and add where you want. In these ways, it’s sort of a gmail-shaped version of forum software, only you pick and choose the team you’re talking with. This is one of the how-to video series about Google Wave at http://www.youtube.com/user/googlewave, which is really quite useful under the sales pitch. From the example given in this video – using Google Wave to organize a community clean-up day – it’s a short step to see how Wave might be used for your own group’s projects. Really good case studies for nonprofit use of Google Wave still seem to be fairly thin on the ground, from what I’ve been able to find – not a lot of recent ones, anyway, after the first flush of experimentation when it was first launched. Wild Apricot used Wave to crowdsource ideas for a Facebook contest last year, when it was still “by invitation only,” with a certain amount of success. The Complete Guide to Google Wave has added a whole new chapter, Wave in Action, to showcase a variety real-world examples – including the use of Wave as a conference backchannel – that’s well worth a look. And it’s a fair bet that many groups are using Wave quietly, behind the scenes, to streamline their internal communications and project management. 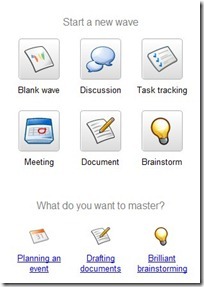 Is your non-profit using Google Wave? Please tell us about it – share your experiences in the comments! Now that Google Wave is open to all, could you use it as a tool for online outreach, as well as for online collaboration? Love Wave! At my non-profit, my 3-person team started using it a year ago to capture check-in agendas, then team agendas. Now I manage an 8-person team. In May, I would run a training conference call for them and they were responsible for capturing their notes in Wave and then sending me their check-in agendas via Wave prior to our meetings. Instead of sending my boss an e-mail for my check-in and then updating him endlessly, I'm able to post items and he posts items and see the same space. It's great!